ABC has announced Galavant, a new musical comedy series about knights, fair maidens, and tyrannical kings, will be coming soon to primetime TV. While Medieval Times and musical comedy seem like an odd combination, this is not the first or last time that Broadway and geek culture have collided. In this new series, I will take a look at musicals that fall firmly in geek culture and Broadway theater culture and examine the good, the bad, and the lady parts in Geeks on Stage. What is Dr. Horrible’s Sing-Along Blog? An amateur super-villain Dr. Horrible (Neil Patrick Harris) is documenting his plans to conquer the world with a video blog, hoping to catch the attention of the Evil League of Evil and their great and terrible leader Bad Horse. His plotting is complicated, however, by his love for Penny (Felicia Day), an activist trying to raise support for a homeless shelter. He meets Penny on laundry day at the local Laundromat, and as he works up the courage to tell Penny how he really feels, Dr. Horrible’s archenemy Captain Hammer (Nathan Fillion) swoops in and woos Penny. The Good Dr. Horrible’s Sing-Along Blog was conceived during the Writer’s Guild strike, a time when many actors, writers, and directors were not working. The series’ creation was a combination of frustrated writers itching to create something as the strike dragged on mixed with the power of Whedon. Maurissa Tancharoen wrote the script with Joss, Jed, and Zack Whedon with Joss and Jed also writing the music, and Joss was able to make a few calls and get talent like Nathan Fillion, Felicia Day, and Neil Patrick Harris on board. The series is fun, sweet, and has a surprisingly sad ending for people unfamiliar with Whedon’s tendency to kill off beloved characters. It also serves as a smart examination of hero of celebrity hero culture as well as internet over-sharing culture. Dr. Horrible talks openly about his nefarious plans in his video blog, but he never considers that the Mayor and Captain Hammer might be watching and preparing for his attack. 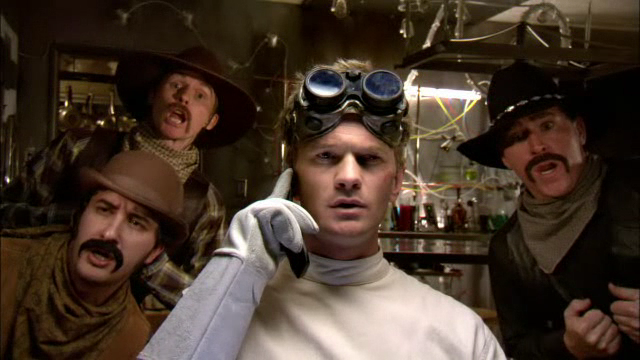 While the cast is all great, Harris is the stand-out as Dr. Horrible. Fillion is funnier as the egotistical Captain Hammer, strutting around and preening like Gaston from Beauty and the Beast, but Harris is the heart of the series. He goes from a timid wannabe anarchist to a love-sick puppy to the super-villain he always dreamed he could be, and he can’t feel a thing, including his broken heart. The Bad To be honest, there is very little to nit-pick over. The production design could have been bigger or better, particularly the exterior street shots, but considering it was distributed online in the days before Husbands and House of Cards, it looks good. The Music Dr. Horrible’s Sing-Along Blog technically has two soundtracks, one for the series itself and one for the singing commentary. Right off the bat, the Whedons went above and beyond for a little writer’s strike project. The music from the series is so popular that sing-along screenings and live stage performances have been hosted at fan events, theaters, and college campuses across the country. Fans sing their favorite songs from the series at karaoke nights. In short, people really love the music. The three strongest songs from the series are “My Freeze Ray,” “My Eyes,” and “Brand New Day.” All three songs are very catchy and move the plot forward without getting dragged down in exposition. “My Freeze Ray” is light and almost bouncy, and it establishes Dr. Horrible’s unrequited crush on Penny. “My Eyes” is the perfect opening to the second act, catching the audience up on Penny and Captain Hammer’s romance and Dr. Hammer’s growing jealousy. “Brand New Day” is a great little villain song that gives Harris the chance to show off his diction skills and give the proper bad guy mua-ha-ha to the camera. The weakest songs of the series are probably “So They Say” and “Everyone’s a Hero.” Neither of them are bad songs, but “So They Say” feels a bit like a catchy time-killer. The tune is a hummable earworm, but it falls in a story lull between “Brand New Day” and the climactic finale. “Everyone’s a Hero” has the opposite problem. This is Captain Hammer’s big solo song, and the lyrics are appropriately pompous and ridiculous. Unfortunately, the melody isn’t quite as catchy as the rest of the soundtrack, and considering its placement in the story, the audience will expect a bigger showstopper. I appreciate it as a satire of Cause songs like “We Are the World” or “Do They Know It’s Christmas,” but in context, it is a little bit underwhelming. What About the Ladies? Penny is the only female character, but fortunately, she is much more developed than just being Dr. Horrible’s dream girl. She is an activist, and long before Dr. Horrible or Captain Hammer came into her life, she was pounding the pavement and asking people to sign her petition for a new homeless shelter. The series hints that Penny had a rough past, and considering her passion for helping the homeless, maybe she was homeless for a while or relied on the kindness of strangers. Despite her hardships, Penny perseveres and remains optimistic about the human race. It isn’t surprising that she gives Captain Hammer a chance as her boyfriend. She wants to change the world, and she wants someone next to her who will fight for a better world too, even if he is a little cheesy on the outside. What Dr. Horrible’s Sing-Along Blog lacks in quantity of female characters, it makes up for in quality. Getting Felicia Day to play Penny also gave the whole project more geek cred. The Geek Factor Dr. Horrible’s Sing-Along Blog is a musical about Neil Patrick Harris trying to win the heart of Felicia Day, but he is foiled by Captain Malcolm Reynolds. Yes, it is very, very geeky. Its Place in Geek Culture Dr. Horrible’s Sing-Along Blog is part of the Whedonverse, so its spot in geek culture is pretty solid at the moment, but only time will prove its longevity. The series will be six years old this summer, so it is still relatively young. The framing device of a video blog might date the series, but the love story and character types are universal enough to overcome any outdated technology. Is it Worth a Look? Yes, and I would recommend watching it a second time through on DVD for the musical commentary track. Dr. Horrible’s Sing-Along Blog shows what talented people are capable of when they have creative freedom, a little bit of money, and the internet.